C. P. E. Bach is having a 300th birthday party in Tallahassee! The “C. P. E Bach at 300” festival features three days of concerts and lectures that celebrate the life, music, and influence of Carl Philipp Emanuel Bach, Johann Sebastian Bach’s fifth child, born 300 years ago in 1714. The festival is presented through a partnership with the FSU College of Music, Musicology area and Early Music Ensembles, with the Tallahassee Bach Parley, and will take place from Friday, November 21 until Sunday, November 23. Members of the Tallahassee Bach Parley. Photo submitted by Erica Thaler. “This three-day festival is an exciting partnership between the FSU College of Music and the Tallahassee Bach Parley,” says Bach Parley music director Valerie Arsenault. “FSU music faculty and students, guest artists from out-of-town, and Tallahassee community musicians will join forces to present the music and world of C. P. E. Bach.” The Tallahassee community is home to a thriving community of Baroque players and enthusiasts, and this festival offers three days of unique musical opportunities for patrons to enjoy. Most of the performances will be on period instruments, including fortepiano (an early incarnation of the modern piano), clavichord (a delicate, intimate, soft-sounding keyboard instrument), along with harpsichord, organ, modern and baroque flutes, period stringed instruments, and guest artist Josh Lee on viola da gamba. Special guest Mark Knoll, a founder of the Tallahassee Bach Parley and FSU College of Music alumnus, will be returning to give the keynote lecture and musical commentary for the concerts. By using period instruments, the musicians will recreate the music using the same tools as when it was first written. History and music will come to life with commentary about the pieces and lectures to provide insight into the works and world of C. P. E. Bach. 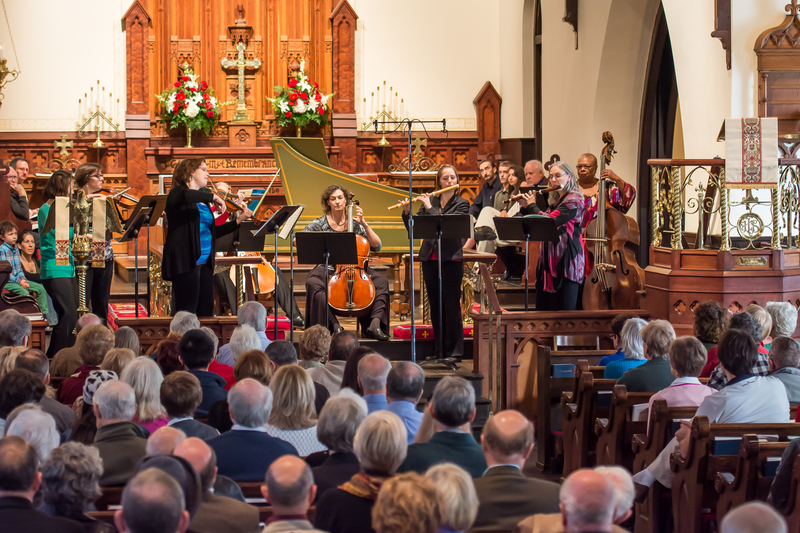 One of the trademarks of the Tallahassee Bach Parley is to provide commentary before the pieces, to give audience members historical background about the composer or the piece, and to give listeners ideas about what to listen for in the music. In fact, the word “Parley” means discussion, so providing an opportunity to talk about the works is part of what makes the Bach Parley unique. Similarly, the entire festival combines guest lectures in addition to performances, so audience members can learn more about the world in which C. P. E. Bach lived and composed his music, bringing the past to life. The festival will begin on Friday evening with an intimate clavichord performance by Charles Brewer at FSU in the Kuersteiner Music Building lounge (limited seating), followed by a lecture “C. P. E. Bach at 300, An Overview: Life, Family, Works, Reception” in Lindsay Recital Hall by visiting scholar Mark Knoll, founder of Steglein Publishing and an editor of the new C. P. E. Bach edition through the Packard Humanities Institute. On Saturday, Dr. Knoll will give a pre-concert lecture followed by a concert of chamber, vocal, and solo keyboard music, including fortepiano, organ, and harpsichord in Opperman Music Hall, FSU. This concert will feature FSU College of Music faculty members Sarah Eyerly (soprano), Joel Hastings (fortepiano), Eva Amsler (modern and baroque flute), Iain Quinn (organ and harpsichord), along with FSU student performers. In the final concert on Sunday, the Tallahassee Bach Parley will join forces with members of the FSU Baroque Ensemble for orchestral and chamber music. Kim Jones will be featured in C. P. E. Bach’s Concerto in A major for cello, and the large ensemble will also play the Berlin Symphony in G major. For the chamber music portion, guest artist Josh Lee will perform a viola da gamba sonata, and Eva Amsler, Melissa Brewer, Iain Quinn, and Valerie Arsenault will play duos, trios, and a quartet. For additional information about the festival or the Tallahassee Bach Parley, visit www.tallahasseebachparley.org or e-mail musicdirector@tallahasseebachparley.org. The FSU College of Music publicity office can be reached at music-publicity@admin.fsu.edu. This week, master Afro-Cuban drummer and drum builder Ezequiel Torres will travel from Miami to Tallahassee with his ensemble in order to highlight the relationships between batá drumming, dance, and the Orisha religion. His two-day residency in Tallahassee is sponsored by the Florida Folklife Program and the Center for Music of the Americas at Florida State University. Ezequiel Torres. Image courtesy/used by permission of HistoryMiami. 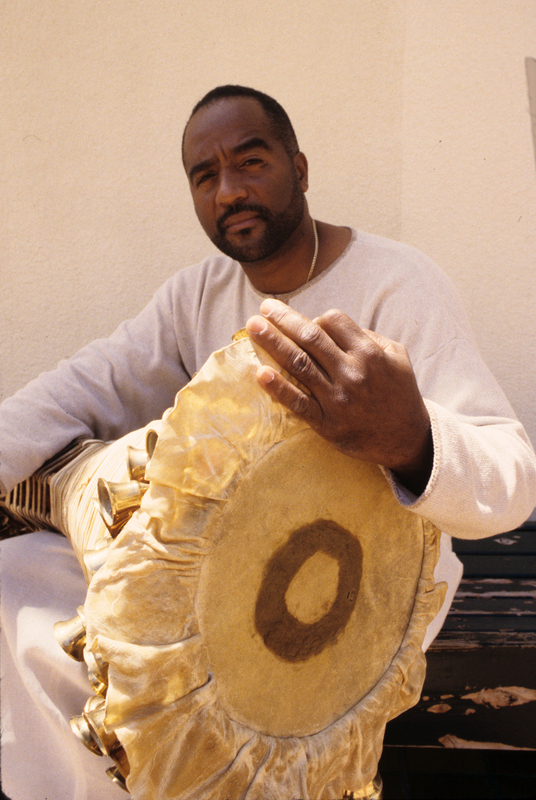 Torres was born in Havana, Cuba in 1955 to a musical family, and in his teens he began working as an apprentice to some of the city’s master drum makers and players. Soon he was performing batá in ceremonies and started experimenting with creating the drums himself. By the late 1970s, Torres was teaching percussion at Havana’s Escuela Nacional de Arte and was the musical director for dance classes at the prestigious Escuela Nacional de Instructores de Arte. The batá is an hourglass-shaped, two-headed drum based on an African prototype. Batá drums are always played in sets of three during religious ceremonies. These ceremonies are part of the Orisha religion, also known in Cuba as Santería, Regla de Ochá, or Lucumí. Dating back to the arrival of African slaves in Cuba, it is a syncretic religion based on West African Yoruba traditions that added associations with Catholic saints to its numerous deities. In religious ceremonies, each of these deities or orishas has their own rhythm played on the batá drums as well as sung vocalizations and specific dance movements. Torres and his ensemble will be demonstrating these at their performances and workshops in Tallahassee. Since arriving in Miami in 1980, Torres has been an important part of Florida’s traditional music scene. He is recognized as one of the top batá drummers, drum-builders, and beaders in the country. In addition to performing regularly in Florida, he has performed in Houston, Chicago, and Los Angeles. Torres has worked with the Florida Folklife Program in various ways after he arrived in the United States. In addition to teaching, performing, and receiving various honors, he was interviewed for the Music from the Sunshine State radio program. You can download or listen to his interview and performance for folklorist Bob Stone on that program here. He has also been a featured artist at the Florida Folk Festival, and you can view his ensemble performing part of a song for the orisha Eleguá at the 2012 festival in the video below. The Florida Folklife Program has been working with Ezequiel Torres for several decades. He has participated in our Apprenticeship Program as a Master Artist six times, passing his expert knowledge of the Afro-Cuban batá drumming tradition to seven apprentices. In 2008, we recognized him with a Florida Folk Heritage Award, and he is the most recent Floridian to win a National Heritage Fellowship from the National Endowment for the Arts, which he received in 2010. Given his many notable contributions to maintaining a living Florida tradition in his South Florida Cuban community, we are excited to introduce him to new audiences in North Florida, and the state capital, where he will be able to share his knowledge and exceptional artistry with a public audience, along with local school children and graduate students at Florida State University. The Center for Music of the Americas at Florida State University is excited to be partnering with the Florida Folklife Program and Mission San Luis in bringing master Afro-Cuban batá drummer and drum-maker, Eqezuiel Torres, to Tallahassee for a two-day artist residency. Mr. Torres’s visit exemplifies the goals of the Center, which include encouraging scholarship, performance, and the dissemination of musics found throughout the American Hemisphere, by reaching out across the university and our larger North Florida community. On Thursday, September 6, Mr. Torres and his ensemble will give a free public performance and presentation in the Mission Room at Mission San Luis from 7-8:30 PM. On the morning of Friday, September 7 there will be a performance and student workshop at Ruediger Elementary School, and that afternoon from 2:30-4:30, he will give a student drumming workshop in Lindsay Recital Hall in FSU’s Kuersteiner Music Building, which is free and open to the public. For more information on this event and others, follow the Florida Folklife Program on Facebook at http://www.facebook.com/FloridaFolklifeProgram. For an additional interview with Ezequiel Torres as well as a video, check out the National Endowment for the Art’s profile of him as a 2010 National Heritage Fellow. Tim Storhoff joined the Division of Cultural Affairs staff last month. He works with the Division’s programs for individual artists, including the Individual Artist Fellowship program, Capitol Complex Exhibitions and the Department of State Art Collection. A native of Fargo, North Dakota, Tim is a doctoral candidate at the Florida State University College of Music. He is currently writing his dissertation on U.S.-Cuban musical interaction. Tim took time to answer a few of my questions about his background in the arts, the importance of individual artists and his belief that Culture Builds Florida. DCA: What’s the first arts experience you can remember? Tim: The first arts experience I remember was seeing and hearing my grandfather play the harmonica and then playing with him. He’s a self-taught performer who will occasionally play just for fun. It was a great instrument for a three-year-old me to put to my mouth because it’s easy to make a sound and feel like you’re doing something right. Making an early musical connection with someone important in my life that way was a great, formative experience. DCA: You’re working on a PhD in musicology with an emphasis in ethnomusicology, and I know this work has taken you to Cuba. What was your most surprising discovery researching music outside of the US? 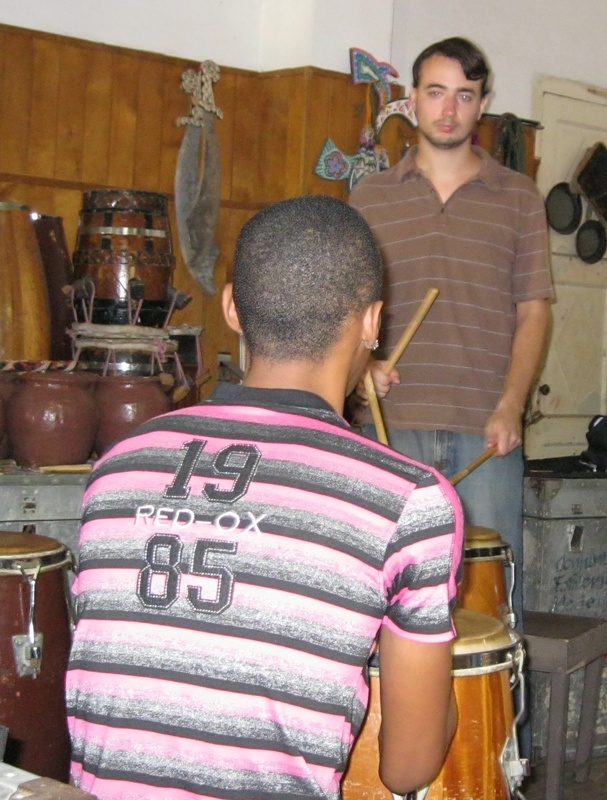 Tim rehearsing drum patterns with a member of the Conjunto Folklórico Nacional in Havana, Cuba. Photo submitted and used by permission of Tim Storhoff. Tim: One thing that really surprised me was how common it was to hear people listening to pop music from the United States. I heard Justin Bieber and Lady Gaga all over Havana. Cuban music was pervasive too, of course. It seemed like whoever I started a conversation with on the street gave me unique advice when I mentioned I was there to learn about music. Everyone knew different dance instructors (or were instructors themselves), suggested different venues to visit each night, and recommended other musicians that I should talk to. It was almost dizzying trying to keep up. I can’t wait to go back. DCA: Why have you decided on a career in the arts? What’s your ultimate career goal? Tim: The arts are a huge part of what makes it worth getting up every morning, and they enrich all of our lives. Because they have always been such a major part of my life, choosing to pursue a career in the arts was easy. I love teaching and writing about music and popular culture, so I hope to pursue a career that allows me to do that. Ultimately, I would like to work with the arts in a university setting. 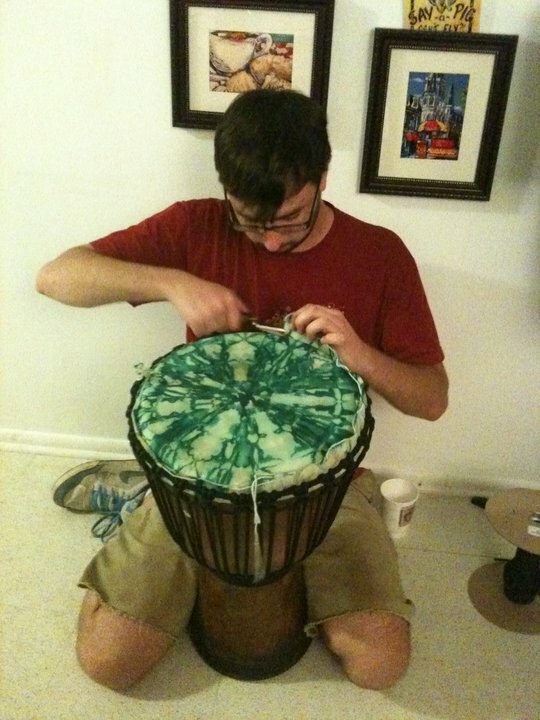 Tim building a djembe. Photo submitted and used by permission of Tim Storhoff. DCA: You’re working with the Division’s individual artist programs. What do you believe individual artists contribute to the fabric of American culture? What do you believe is most important about their work? Tim: Individual artists are very important to American culture, and we have historically celebrated the achievements of the individual with good reason. Not to discount the institutions and collaborators that contribute to artistic work, but we typically look to the individual to give art its definitive voice and make an artistic statement. I’m really happy we have programs to support individual artists and the work they find personally meaningful, because in the end it is those creations that enrich our communities and the world around us. Tim: I think that is a great motto because the arts and culture are really important to our state socially and economically. Florida is extremely diverse, and the arts are the best way to showcase the cultural diversity our state has to offer. At the same time, art is great at bringing people together and building bridges between individuals and groups that otherwise might not interact. Culture makes Florida the vibrant state that it is, and embracing it opens up all kinds of new possibilities.